Malta, officially Republic of Malta, is a small and densely populated island nation comprising an archipelago of seven islands in the Mediterranean Sea. A country of Southern Europe, Malta lies south of Sicily, east of Tunisia, and north of Libya. The country's official languages are Maltese and English. Roman Catholicism is the most practiced religion. 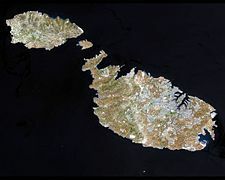 The islands constituting the Maltese nation have been ruled by various powers and fought over for centuries. Malta has been a member state of the European Union (EU) since 2004 and it is currently the smallest EU country in both population and area, though it is one of the most densely populated countries in the world. A small archipelago strategically located, Malta has had a long and turbulent history. Situated in the middle of the Mediterranean Sea, it has historically played a central role in larger countries' struggles for control of the area. Its culture has thus been molded by various rulers; European, African and Middle Eastern. Malta is an archipelago of coralline limestone in the central Mediterranean Sea (in its eastern basin), some 93 km south of the Italian island of Sicily across the Malta Channel; east of Tunisia and north of Libya in Africa. Only the three largest islands Malta Island (Malta), Gozo (Għawdex), and Comino (Kemmuna) are inhabited. The smaller islands, such as Filfla, Cominotto and the Islands of Saint Paul are uninhabited. The country is approximately 316 km² in area. Numerous bays along the indented coastline of the islands provide good harbors. The landscape is characterized by low hills with terraced fields. The highest point is at Ta' Dmejrek on Malta Island at 253 metres (830 ft) near Dingli. Although there are some small rivers at times of high rainfall, there are no permanent rivers or lakes on Malta. However some watercourses are found randomly around the island that have fresh water running all year round. 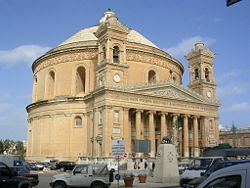 Such places are Baħrija, Imtaħleb and San Martin. Running water in Gozo is found at Lunzjata Valley. Contrary to popular belief, the south of Malta is not Europe's most southern point; that distinction belongs to the Greek island of Gavdos. The entire Greek island of Crete is more southern than any point of Malta. Malta stands on an underwater ridge that extends from North Africa to Sicily. At some time in the distant past Malta was submerged, as shown by marine fossils embedded in rock in the highest points of Malta. As the ridge was pushed up and the straits of Gibraltar closed through tectonic activity, the sea level was lower, and Malta was on a bridge of dry land that extended between the two continents, surrounded by large lakes. Some caverns in Malta have revealed bones of elephants, hippopotamus, and other large animals now found in Africa, while others have revealed animals native to Europe. The climate is Mediterranean (Köppen climate classification Csa), with mild, rainy winters and hot, dry summers. There is no real thermal dormant season for plants, although plant growth can be checked briefly by abnormal cold in winter (patches of ground frost may occur in inland locales), and summer heat and aridity may cause vegetation to wilt. Effectively there are only two seasons, which makes the islands attractive for tourists especially during the drier months. However, strong winds can make Malta feel cold during the spring months. In January 2014, International Living chose Malta as one of three countries with the best climate in the world. 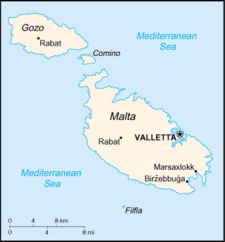 The soil on Malta is considered immature and thin, supporting little naturally occurring plant life. Wild vegetation on the islands is sparse; most plant life is cultivated. This includes an abundance of potatoes, onions, and tomatoes. A variety of trees include carob, fig and chaste. The government has initiated a major tree-planting program to improve forestation on the islands. The megalithis temple of Mnajdra. 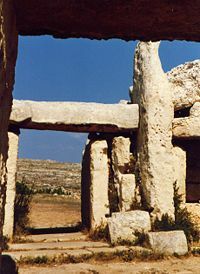 Malta is home to what may be the oldest freestanding structure in the world: the oldest of all the megalithic temples on the islands is il-Ġgantija, in Għawdex dating back to before 3500 B.C.E. One of the earliest marks of civilization on the islands is the temple of Ħaġar Qim, which dates from between 3200 and 2500 B.C.E., stands on a hilltop on the southern edge of the island of Malta. Adjacent to Ħaġar Qim, lies another remarkable temple site, l-Imnajdra. The society that built these structures eventually died out, or disappeared. Phoenicians colonized the islands around 700 B.C.E., using them as an outpost from which they expanded sea explorations and trade in the Mediterranean. The islands later came under the control of Carthage (400 B.C.E.) and then of Rome (218 B.C.E.). The islands prospered under Roman rule, during which time they were considered a Municipium and a Foederata Civitas. Many Roman antiquities still exist, testifying to the close link between the Maltese inhabitants and the people of Rome. In 60 C.E., the islands were visited by Saint Paul, who is said to have been shipwrecked on the shores of the aptly-named "San Pawl il-Baħar." Studies of the currents and prevalent winds at the time however, render it more likely that the shipwreck occurred in or around Daħlet San Tumas in Wied il-Għajn. After a period of Byzantine rule (fourth to ninth century) and a probable sack by the Vandals, the islands were conquered by the Arabs in 870 C.E. The Arabs, who generally tolerated the population's Christianity, introduced the cultivation of citrus fruits and cotton, and irrigation systems. Arab influence can be seen most prominently in the modern Maltese language, which also contains significant Romance influences, and is written in a variation of the Latin alphabet. The period of Arab rule lasted until 1091, when the islands were taken by the Siculo-Normans. A century later the last Norman king, Tancredo di Lecce, appointed Margarito di Brindisi the first Count of Malta. Subsequent rulers included the Angevin, Hohenstaufen, and Aragonese, who reconstituted a County of Malta in 1283. The Maltese nobility was established during this period; some of it dating back to 1400. Around 32 noble titles remain in use today, of which the oldest is the Barony of Djar il-Bniet e Buqana. 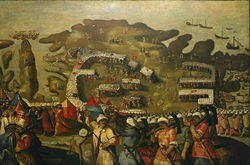 The Great Siege of Malta – arrival of the Turkish Fleet. A fresco by Matteo Perez d'Aleccio in the sixteenth century. Probably located in the grand hall of the Palace of the Grand Masters in Valletta. In 1530, Holy Roman Emperor Charles V of Spain gave the islands to the Order of Knights of the Hospital of Saint John of Jerusalem in perpetual lease. 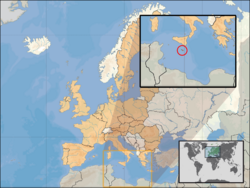 (The Kingdom of Aragon had owned the islands as part of its Mediterranean empire for some time). These knights, a military religious order now known as the "Knights of Malta," had been driven out of Rhodes by the Ottoman Empire in 1522. They withstood a full-blown siege by the Ottoman Turks in 1565, at the time the greatest sea power in the Mediterranean Sea. After this they decided to increase the fortifications, particularly in the inner-harbor area, where the new city of Valletta, named after Grand Master Jean de la Valette, was built. Their reign ended when Malta was captured by Napoleon en route to his expedition of Egypt during the French Revolutionary Wars in 1798. As a ruse, Napoleon asked for safe harbor to resupply his ships, and then turned his guns against his hosts once safely inside Valletta. The Grandmaster knew that he could only allow a few ships at a time to enter the harbor due to the Treaty of Trent. Grand Master Ferdinand von Hompesch zu Bolheim capitulated, and Napoleon stayed in Malta for a few days, during which time he systematically looted the movable assets of the Order, and established an administration controlled by his nominees. He then sailed for Egypt, leaving a substantial garrison in Malta. The occupying French forces were unpopular, however, due particularly to their disdain of religion. The attempted financial and religious reforms were not accepted by the Maltese citizens, who rebelled against them, and the French were forced behind the fortifications. Great Britain, along with the Kingdom of the Two Sicilies, sent munitions and aid to the rebels. Britain also sent the Royal Navy, which instigated a blockade of the islands. The isolated French forces, under General Claude-Henri Belgrand de Vaubois, surrendered in 1800, and the island became a British Dominion, being presented by several Maltese leaders to Sir Alexander Ball. In the early 1930s, the British Mediterranean Fleet, which was at the time the main contributor for the commerce on the island, was moved to Alexandria as an economic measure. Malta played an important role during World War II, owing to its vicinity to Axis shipping lanes. The bravery of the Maltese people in their long struggle against enemy attack moved King George VI to award the George Cross to Malta on a collective basis, unique in the history of the award, on April 15, 1942, "to bear witness to a heroism and devotion that will long be famous in history." Some historians argue that the award caused Britain to incur disproportionate losses in defending Malta, as British credibility would suffer if Malta was subsequently surrendered to the Axis, as Singapore had been. A replica of the George Cross now appears in the upper hoist corner of the Flag of Malta. The Maltese euro coins, however, feature the Maltese cross. Mikhail Gorbachev and George H. W. Bush sharing a meal aboard the Soviet cruise ship Maxim Gorky, in Marsaxlokk Harbour, Malta. After the war, and after a short period of political instability due to the Malta Labour Party's unsuccessful attempt at "Integration with Britain," Malta was granted independence on September 21, 1964 (Independence Day). Under its 1964 constitution, Malta initially retained Queen Elizabeth II as Queen of Malta, with a Governor-General exercising executive authority on her behalf. On December 13, 1974 (Republic Day), however, it became a republic within the Commonwealth, with the President as head of state. A defense agreement signed soon after independence (and re-negotiated in 1972) expired on March 31, 1979 (Freedom Day) when the British military forces were withdrawn. Malta adopted an official policy of neutrality in 1980 and, for a brief period was a member of the Movement of Non-Aligned Countries. In 1989, Malta was the venue of an important summit between US President Bush and Soviet leader Gorbachev, their first face-to-face encounter, which signaled the end of the Cold War. Malta joined the European Union on May 1, 2004. Following the conclusions of the European Council of June 21-22, 2007 it will be joining the Eurozone in 2008. The politics of Malta take place in a framework of a parliamentary representative democratic republic, whereby the Prime Minister of Malta is the head of government, and of a pluriform multi-party system. Executive power is exercised by the government. Legislative power is vested in both the government and parliament. Since Independence the party system has been dominated by the Christian Democratic Nationalist Party (Partit Nazzjonalista) and the Social Democratic Malta Labour Party (Partit Laburista). The nation's parliamentary system and public administration is closely modeled on the Westminster system. The unicameral House of Representatives, is elected by direct universal suffrage through single transferable vote every five years, unless the House is dissolved earlier by the President on advice of the Prime Minister. The House of Representatives is made up of sixty-five Members of Parliament. However, where a party wins an absolute majority of votes, but does not have a majority of seats, that party is given additional seats to ensure a parliamentary majority. The Constitution of Malta provides that the President appoint as Prime Minister the member of the House who is best able to command a (governing) majority in the House. Democratic Alternative, a Green Party. Liberal Democratic Alliance  a liberal reformist party. Azzjoni Nazzjonali, a neoconservative party. Since 1994, Malta has been subdivided into 68 local councils or districts. These form the most basic form of local government. There are no intermediate levels between the local government and the national government. The levels of the 6 districts (5 on the main island) and of the 3 regions (2 on the main island) serve statistical but no administrative purposes. The objectives of the Armed Forces of Malta (AFM) are to maintain a military organization with the primary aim of defending the Islands' integrity according to the defense roles as set by Government in an efficient and cost effective manner. This it does by emphasizing on the maintenance of Malta's territorial waters and airspace integrity. As a military organization, the AFM also provides backup support to the Malta Police Force and other Government Departments/Agencies in situations as required in an organized, disciplined manner in the event of national emergencies (such as natural disasters) or internal security and bomb disposal. On another level, the AFM establishes and/or consolidates bilateral co-operation with other countries to reach higher operational effectiveness related to AFM roles. In 1869, the opening of the Suez Canal benefited Malta's economy greatly as there was a massive increase in the shipping which entered in the port. Entrepot trade saw many ships stopping at Malta's docks for refueling, this brought great benefits to the population. By the end of the nineteenth century, the economy began declining and by the 1940s, Malta's economy was in serious crisis. This was partially due to the longer range of newer merchant ships which required less frequent refueling stops. Today Malta’s major resources are limestone, a favorable geographic location, and a productive labor force. Malta produces only about 20 percent of its food needs, has limited freshwater supplies, and has no domestic energy sources. The economy is dependent on foreign trade (serving as a freight trans-shipment point), manufacturing (especially electronics and textiles), and tourism. Tourism infrastructure has increased dramatically over the years and a number of good-quality hotels are present on the island. An increasing number of Maltese now travel abroad on holiday. Although they are still a net importer of tourism, the ratio of inbound tourists to outbound tourists is decreasing. Film production is a growing contributor to the Maltese economy, with several big-budget foreign films shooting in Malta each year. The country has increased the exports of many other types of services such as banking and finance. Malta has recently privatized some state-controlled firms and liberalized markets in order to prepare for membership in the European Union, which it joined on May 1, 2004. Malta and Tunisia are currently discussing the commercial exploitation of the continental shelf between their countries, particularly for petroleum exploration. The Maltese government entered ERM II on May 4, 2005, and is intending to adopt the euro as the country's currency on January 1, 2008. Recently investments in Malta have been increasing and the strength of the Maltese economy is increasing. An example is Smart City, Malta, designed and financed by Dubai, which is estimated to provide state-of-the-art work space, residential areas, and employ well over 5000 new jobs for knowledge workers. Although Malta is now a member of the European Union, it is not a member of the Schengen Treaty. It is currently adopting Schengen regulations with the goal of joining in March 2008. Malta is the most densely populated country in the European Union and one of the most densely populated countries in the world, with about 1,265 inhabitants per square kilometer (3,000 per square mile). This compares with about 32 per square kilometer (85 per square mile) for the United States. Inhabited since prehistoric times, Malta was first colonized by the Phoenicians. Subsequently, Arabs, Italians, Spanish, French and the British and Irish have influenced Maltese life and culture to varying degrees. Most of the foreign community in Malta, predominantly active or retired British nationals and their dependents, is centered on Sliema and surrounding modern suburbs. Malta has seen emigration of a large portion of their people to live elsewhere, and Maltese communities exist throughout Europe (esp. Maltese laborers who relocated in Italy, Spain, Germany, France, Sweden, the Netherlands, Greece and the United Kingdom), while larger Maltese immigrant communities are in Australia, Canada, New Zealand, Brazil, the United States and to a smaller extent, Puerto Rico. Malta has two official languages—Maltese (a Semitic language derived from Arabic and heavily influenced by Sicilian) and English. Both languages are compulsory subjects in Maltese primary and secondary schools. A large portion of the population is also fluent in Italian, which was, until 1936, the national language of Malta. The literacy rate has reached 93 percent, compared to 63 percent in 1946. Schooling is compulsory until age 16. The Maltese alphabet is based on the Latin alphabet, but uses the diacritically altered letters ż, also found in Polish, as well as the letters ċ, ġ, għ, ħ and ie, which are unique to Maltese. French, German and Spanish, among other languages, are taught as foreign languages in secondary schools. The Constitution of Malta provides for freedom of religion but establishes Roman Catholicism as the state religion. Freedom House and the World Factbook report that 98 percent of the population is Roman Catholic, making the nation one of the most Catholic countries in the world. However, the Sunday Mass Attendance Census of 2006 commissioned by the The Archdiocese of Malta reports that only 52.6 percent of the population attends regular religious services. Although comments by Archbishop Charles Scicluna in March 2015 indicated that attendance had dropped further to around 40 percent, it remains among the highest rates of attendance in Europe. Around 22 percent of the population is reported to be active in a church group, Movement or Community. Malta has the highest concentration of members per capita of the Neocatechumenal Way in the world, since it was introduced in the Islands in 1973 by three Italian catechists, who started the first community in the Parish Church of Kuncizzjoni in Hamrun. In June 2007 Pope Benedict XVI canonized George Preca, known as Dun Ġorġ, as the first Maltese saint. Maltese laws for immigration generally follow EU legislation. Therefore EU nationals require neither a visa nor a passport (an ID card or an expired passport are enough) to enter the country. Citizens of a number of other countries are also not required to apply for a visa and require only a valid passport when residing in Malta for up to three months. Visas for other nationalities are valid for one month. Immigrants are required to apply for a work permit. 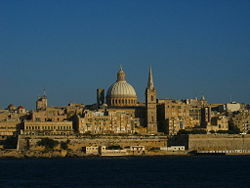 During 2006, a total of 1,800 immigrants reached Malta illegally. Given Malta's high population density, the impact of this figure on Malta is equivalent to that of an arrival of 369,000 illegal immigrants in Germany and other large EU member states. In the first half of 2006, 967 illegal immigrants arrived in Malta – almost double the 473 who arrived in the same period in 2005. The main factor contributing to the problem is Malta's approximately 250,000 square kilometers of open sea search and rescue region. Around 45 percent of illegal immigrants landed in Malta have been granted refugee (5 percent) or protected humanitarian status (40 percent), which is the highest rate of acceptance in the EU. A White Paper suggesting the grant of Maltese citizenship to refugees resident in Malta for over ten years was issued in 2005. Historically Malta gave refuge (and assisted in their resettlement) to eight hundred or so East African Asians who had been expelled from Uganda by Idi Amin and to just under a thousand Iraqis fleeing Saddam Hussein's regime. In 2005, Malta sought EU aid in relation to reception of illegal immigrants, repatriation of those denied refugee status, resettlement of refugees into EU countries, and maritime security. In December 2005, the European Council adopted The Global Approach to Migration: Priority Actions focusing on Africa and the Mediterranean; but the deployment of said actions has been limited to the western Mediterranean, thus putting further pressure on the central Mediterranean route for illegal immigration of which Malta forms a part. Education in Malta is compulsory between the ages of 3 and 16 years. While the state provides education free of charge, the Church and the private sector run a number of schools in Malta and Gozo, such as St. Aloysius' College in Birkirkara. Most of the teachers' salary in Church schools is paid by the state. The country's education system is based on the British model. Primary School lasts six years. At age 11, students sit for an examination to enter a Secondary School, either a Church School (the Common Entrance Examination) or a State School. Students sit for SEC O'Level Examinations at age 16, with passes obligatory in certain subjects such as Mathematics, English and Maltese. Students may opt to continue studying at a Sixth Form or at another post-secondary institution such as MCAST. The Sixth Form course lasts for two years, at the end of which students sit for the Matriculation examination. Subject to their performance, students may then apply for an undergraduate degree or diploma. Tertiary education at diploma, undergraduate and postgraduate level is mainly provided by the University of Malta (UoM). The adult literacy rate is 92.8 percent. The culture of Malta is a reflection of various cultures that have come into contact with the Maltese Islands throughout the centuries, including neighboring Mediterranean cultures, and the cultures of the nations that ruled Malta for long periods of time prior to its independence in 1964. Maltese cuisine is the result of a long relationship between the Islanders and the many foreigners who made Malta their home over the centuries. This marriage of tastes has given Malta an eclectic mix of Mediterranean cooking. Many popular Maltese specialties are Italian/Sicilian or Moorish in origin. While Maltese music today is largely western, traditional Maltese music includes what is known as għana. This consists of background folk guitar music, while a few people take it in turns to argue a point in a singsong voice. The aim of the lyrics, which are improvised, are to create a friendly yet challenging atmosphere, and takes a number of years of practice to be able to combine the required artistic qualities with the ability to debate effectively. ↑ Malta: General data of the country. Populstat.info. Retrieved December 1, 2011. ↑ Central Intelligence Agency, Malta The World Factbook. Retrieved December 1, 2011. ↑ National Statistics Office, Malta, Malta in Figures (2008). Retrieved December 1, 2011. ↑ 4.0 4.1 4.2 4.3 Malta. International Monetary Fund. Retrieved December 1, 2011. ↑ National Statistics Office, Malta, Census of Population and Housing 2005: Preliminary Report (2005). Retrieved December 1, 2011. ↑ Matt McGrath, April 4, 2007 Environment reporter, BBC World Service. Briny future for vulnerable Malta Retrieved December 28, 2007. ↑ Ecuador, Uruguay And Malta Boast Best Climates In The World, International Living. Retrieved April 12, 2016. ↑ Encyclopædia Britannica, Malta Encyclopædia Britannica Online. Retrieved April 12, 2016. ↑ Claudia Sagona, Punic Antiquities of Malta and Other Ancient Artefacts Held in Ecclesiastic and Private Collections. Ancient Near Eastern Studies Supplement Series, No. 10. (Peeters Publishers, 2003, ISBN 978-9042913530), 374. ↑ Eric Grove, "The Siege of Malta in World War Two." Retrieved December 28, 2007. ↑ Alleanza Liberal-Demokratika. Retrieved December 28, 2007. ↑ Ariadne Massa, Sunday Mass attendance down again Times of Malta, August 23, 2006. Retrieved April 12, 2016. ↑ Kristina Chetcuti, Updated: Church attendance down to 40% Times of Malta, March 24, 2015. Retrieved April 12, 2016. ↑ National Statistics Office, Malta. Demographic Review 2004 Retrieved December 28, 2007. ↑ Ministry of Foreign Affairs Valletta 30 January 2006 Frendo holds talks with three European Union Commission Members. Retrieved July 6, 2007. ↑ Ministry of Foreign Affairs Valletta. 3 July 2006 Statement by the Minister of Foreign Affairs Dr. Michael Frendo to resident EU Ambassadors on illegal immigration in Malta. Retrieved July 6, 2006. ↑ The Sunday Times Immigrants refused entry into Malta 16 July 2006. Retrieved July 17, 2006. ↑ Michael Frendo,"Illegal Immigration in Malta." EU Foreign Ministers Council. Ministry of Foreign Affairs 5 July 2005. Retrieved July 6, 2006. ↑ About Malta.com. Education in Malta Retrieved January 23, 2008. ↑ CIA World Factbook. Malta Retrieved January 23, 2008. BBC. 1942: Malta gets George Cross for bravery "On this day." Retrieved January 21, 2014. This page was last modified on 9 August 2018, at 15:48.